The Oracle at Delphi was always correct. Every ancient Greek source confirms this truth. No matter what you asked the Oracle, the answer would accurately foretell the future. However, thanks to surviving prophecies, we now know she owes this accuracy to vagueness. The Oracle answered questions in ways that could mean anything. When asked about the outcome of a battle, her answer might be, “A great kingdom will fall.” That kingdom could be yours or your opponent’s, but whose became clear only after the fact. Hence, the Oracle was never wrong. For the skeptics of the ancient world, this must have been frustrating to the point of infuriating. This is equally true of As Foretold. I have been quietly experimenting with this card since Amonkhet was released and I still cannot tell if it is good. Every time I play the card I feel like I’m rolling dice. It might be good, it might be mana wasted. I never know until after the game whether the card was good. Sometimes, even then it gets messy. My gut tells me it’s a win-more card, but I keep seeing just enough potential to stop me from dismissing As Foretold. I just can’t tell if it’s the real deal or if it’s just…oh, what’s the word? It’s always best to start at the beginning. As Foretold has generated a lot of hype and speculation. Everyone should know what it does by now, but as a reminder, it’s an Aether Vial for any spell with converted mana cost less than or equal to its number of time counters. Rather than tap, it allows players to cast a free spell once each turn, or twice each turn cycle. Essentially, it’s a mana generator. I was pretty down on the card in my preview article. I could not determine where the card belonged, and it looked too much like a win-more card for me to seriously investigate. However, Jordan was much more open to the card. He noted how busted free mana has been and how control decks could leverage the free spell effectively. I can see the point, but to me the problems with the card—chiefly, its durdliness and slowness—outweighed any advantage. I just didn’t see how it could be worthwhile. The thing is, it appears I was in the minority on As Foretold, at least among online writers. Sean McLaren went on about it at length the day after I was dismissive. Ben Friedman thinks it is broken. Frank Lepore tried it and had fun. Then again, playing less-than-competitive decks and having fun doing so is his thing, so it’s hard to draw serious conclusions from Lepore. My point is that there was enough evidence that the card was reasonable that I began to soften. All that was coupled with pressure from players at my LGS who really liked the card. I’m a fast player who normally plays fast decks, so I have a lot of free time to talk shop. Once again, I proved to have the minority opinion, as most players thought Foretold at least deserved a try. Some were all over the card and desperately wanted to break it. When I consistently find myself in the minority, I like to carefully reexamine my position in case I’m one who’s wrong. I decided to reevaluate my position and give As Foretold another look. I started playing around with Foretold towards the end of April, and I wasn’t having any success. Everyone agreed with my assessment that Foretold belonged either in control or in a dedicated combo shell, so I conducted my tests with UW Control. I felt that just jamming the card into any existing combo deck was a recipe for clunk, and I was skeptical of other control decks succeeding in this metagame. I started McLaren’s suggested list, and then brewed and tuned based on my experience. I didn’t really have any success. Of course, the build may just have been unrefined. However, I was also not impressed by Foretold itself. I never felt like it did anything. Yes, I cast free spells when it was in play, and yes, getting to play Ancestral Vision right away felt good. I just never felt that it was winning me games I would otherwise have lost. My testing in control shells ended up with a decklist very similar to the one that Ross Merriam highlighted. Not exactly the same, but close enough that I won’t post the decklist. What I want to highlight is that Merriam’s on-camera experience very closely mirrored my own. As Foretold‘s most relevant use is accelerating Ancestral Visions, which may not even be good, because on turn three you may have to discard. That’s not the worst, but it’s also nothing special. After several weeks of having “nothing special” as my results, I put the Foretold’s away. I don’t have the evidence to say that they are worthwhile in control. However, control isn’t Foretold’s only possible shell. A number of players that I’ve run into online and at my LGS have tried to build around the card more centrally. I don’t think there’s any collusion between them, and it would be anomalously coincidental to the point of paranoid conspiracy if the paper players were also the online players, but they’ve all arrived at Jeskai Restore Balance decks. I don’t have their lists, but each one is built around Greater Gargadon, Restore Balance, As Foretold, and Nahiri, the Harbinger. In addition, they have a number of cheap interactive cards, Ancestral Vision, and sometimes Wheel of Fate. I’ve never actually seen them cast Wheel, but they are trying it. 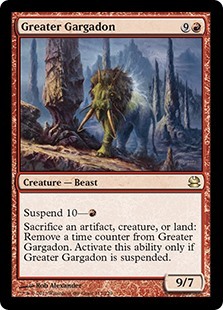 Their idea is that you are Jeskai Control but get to play a prison-style game with Restore Balance enabled by Gargadon. To my knowledge none of these decks have won any events, but they’ve done reasonably well for the past week. When they assemble their pieces, the decks I’ve seen are very potent. There’s just not much you can do when you have no lands against a Greater Gargadon, a full grip of cards, and free spells every turn. However, the operative word in the first sentence is when. More than other decks, these Balance decks need to draw the right cards at the right time to have any chance of victory. Failing to draw Balance can prove fatal. Not setting Balance up with Gargadon can spell doom. Failure to draw Foretold may cause the deck to do nothing. I’ve played a number of games against the deck where Foretold never resolved and I won with lots of my opponent’s scary suspended spells several turns away from resolving. There is power there, and where there is power there is potential, but as far as I’m concerned, these decks are unforgivably fragile. My final problem is that Restore Balance already exists as a deck. A deck that, while it isn’t very good in the overall metagame, is very good at enabling Restore Balance. As a Balance deck, the Foretold version is noticeably worse than the older versions. From what I’ve seen so far, I don’t think they do anything else enough better to justify deviation. I still have serious doubts about As Foretold in Modern. It’s durdly and slow, but that really isn’t the problem. The problem is impact. Of course, enablers are only as powerful as the things they enable, and there are some very powerful things that you can do with Foretold. But what happens when you don’t? What if you don’t have Ancestral Vision when you play Foretold, or it’s incorrect to play Balance then? Foretold won’t always enable anything you want to do. And this is the fatal flaw of the card. During testing, I found that in UW Control, the card didn’t do that much. In normal builds, I rarely feel that I lose because I couldn’t cast enough spells. I often have mana constraints, but that’s not why I lose. By itself, Foretold doesn’t solve that problem, although it improves drawing Vision late. Of course, most UW decks have solved that problem already by replacing Vision with Think Twice or other cantrips. I didn’t find that I needed extra mana very often as long as I hit my land drops. Control rarely struggles with playing the spells in its hand. It struggles with having the right spells at the right time. Foretell helps with the former and not with the latter. What you want to be doing with Foretold in control decks is using the free spells to do things other than answering your opponent. The problem is that most of your deck is cheap answers. As a result, I found that I was in fact wasting mana because of Foretold. Where I really wanted the mana was when I got over four counters, because that’s when it enables sweepers and planeswalkers with protection. Of course, the best-case scenario occurs around turn seven, by which time control is either dead or stabilized anyway. I just never really needed more mana in most of my test games. Control decks are already built to leverage a mana advantage over time and play more powerful spells later in the game. At best, Foretold reinforces that trait. At worst, it forces you to drop your shields at sorcery speed to generate an incremental advantage down the line. There are plenty of decks that can either functionally or actually win the game in that window. Foretold asks us to justify cutting control cards for a ramp spell… in a control deck. However, despite all of this, I have found enough upside in Foretold that I can’t just dismiss its potential. There are times when you are constrained on mana or outright mana screwed, and in those situations, Foretold is a lifesaver. That’s when you actually need the extra mana, and in those situations, the benefit actually does balloon over time. Furthermore, that extra mana really had an impact when I tried a Foretold Control deck against a normal UW deck. Now, it didn’t resolve very often, and on a few occasions I got really punished for tapping out turn three, but those times when I did resolve Foretold, the mana advantage it generated provided the leverage I needed to grind out my opponent. I was left wondering if Foretold isn’t actually an engine card but the new Geist of Saint Traft: a way to break control mirrors. It may be too slow compared to Geist, but an enchantment is also less vulnerable. Perhaps something to circle back to down the line. There is still the possibility that there exists a deck to really abuse As Foretold lurking somewhere out there. Modern’s cardpool is a vast and unexplored jungle, after all. I’ve seen enough to prevent me from outright dismissing the card, but I am getting close. Anyway, it’s now time for what everyone is really here for: the voting results! By a vote of 21 to 12, the winner is Preordain! Frankly, I’m relieved. I not only wanted Preordain to win, I assumed it would before I put the issue to a vote. It would have been embarrassing to redo the preparations I’d already done if Dig had won instead. So I’ll be getting started on that and should have results… eventually. Late summer/early fall, probably. A number of readers have expressed interest in helping with this project. I want to thank you for the offers, but I have a crew that is more-or-less willing to help already, and I know when and where to find them. I will keep those who have expressed interest in mind, and I may have a request for you soon. Stay tuned. I’m geniunely glad that Wotc is printing cards that are just barely not good enough for Modern, like Bedlam Reveler and Thing in the Ice. These cards allow us to get excited, discuss, and experiment, without breaking the format. I agree, though whether Foretold actually belongs in that category is still unknown. What I really appreciate is that it isn’t simply good and may not be broken, despite appearances. It helps Wizards to claw back some of the faith they lost with Oath of the Gatewatch. Nope. From what I’ve seen (don’t actually know their lists) they’re on full sets of Visions and Balance with no cascaders. – Nahiri put Emrakul on bf.